One wonderful thing about email is that it gets delivered instantly, with no delay. But this can sometimes be a problem. Imagine a case where you sent the wrong document to your boss via gmail or you mistakenly sent a message meant for your wife to the wrong person. In this case, reverse is the answer. For the Gmail users, there is good news for you. If you’re a Gmail user, there’s a quick and effective way to recall a sent email before the worst can happen. The feature helps bring back the email — keeping it from appearing in the recipient’s inbox. Follow this procedure to use the feature on both mobile and the web. 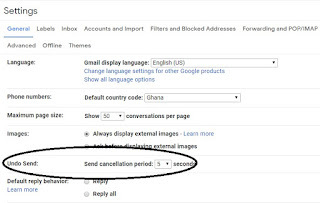 Although Google has made this a standard feature, which means it’s now always on in Gmail, you’d still need to check the settings to be sure it’s properly customized. First, sign into your Gmail account . Now select the gear icon in the upper-right corner, and from this menu, you should select ‘Settings’. All the special features you can activate or adjust in Gmail can be located in the ‘Settings’ menu. Scroll down the ‘General’ tab till you get to the ‘Undo Send’ section. This is where you’ll find an option to adjust the ‘Send cancellation period’. You can choose for up to 30 seconds (in an increments of 5 seconds or more) to be how long you have to be able to recall an email. Five seconds isn’t very long for you to quickly hit the unsend option if you have made a mistake. If you ask me, 20 to 25 seconds is safer. Scroll to the bottom of the ‘Settings’ section and save your changes once you’re done. It’s important to act quickly in recalling an email, as some people once they receive a notification will go ahead to read the message — in a case like this, so sorry because there is no remedy after your sent email is read. Now that you’ve made your preferred changes, it’s time to test the service out. Hit ‘Compose’ and send a quick email to yourself. At the lower left corner of your Gmail window, you’d see a ‘sent’ notification pop up there that says “Message sent” — giving you options to view the message or create a new one. Between those options will be the ‘Undo’ option. 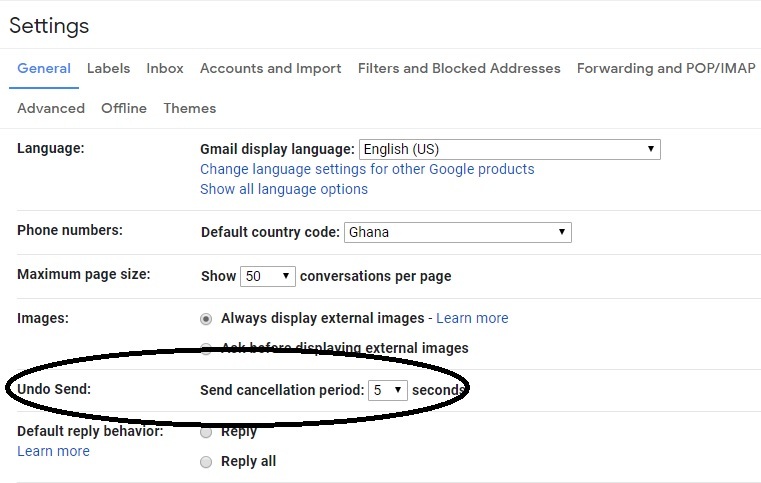 The ‘Undo’ option will stay visible until your cancellation time elapses. After that you can’t recall the email anymore. So, be fast to make decision. On iOS or Android, recalling emails is just the same as it is on the web browser. You’ll see the option to ‘Undo’ a sent email at the bottom-right side of the screen after sending an email. Tap that button, and you should be good to go. Be sure to act fast as the button will only show up for a few seconds. And yea, don't forget to hit the share buttons to share with friends.